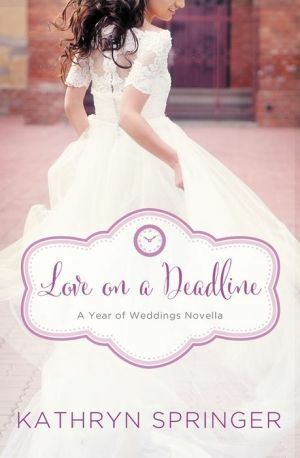 Meet the people who make it all happen -- the planners, the photographers, the musicians who have helped orchestrate the perfect day for countless couples -- as they find their own happy endings in the second Year of Weddings novella collection. MacKenzie “Mac” Davis left her hometown of Red Leaf, Wisconsin, to pursue a degree in journalism. But when her dad, the town's beloved Coach Davis, suffers a mild heart attack, Mac returns home to help out. She takes a job at the weekly newspaper but instead of covering serious topics, her editor wants her to write about social events -- like the garden club's flower show and the historical society's afternoon tea. Mac knows it's no way to earn her father's respect -- or the attention of one of the newspapers she hopes will hire her when she leaves Red Leaf. When Hollis Channing, Mac's high school nemesis, returns to Red Leaf to marry her celebrity fiancé, the editor asks Mac to cover the big event -- and all the festivities leading up to -- for the newspaper. The last thing Mac wants to do is reconnect with the person who made her life miserable when she was a teenager . . . unless it's spending time with Ethan Channing, the bride's older brother -- and Mac's first crush. Mac is no longer the awkward girl who wore the school mascot costume to the Homecoming dance but she realizes something hasn't changed. Her feelings for Ethan.